The month of March is considered to be the start of spring in Hollywood. Studios try to capitalize on that by releasing a big-budget film that will appeal to an all-ages audience. In the past couple of years, Disney hasn’t done so well in the month of March. Before their missed opportunity with last year’s “John Carter”, they suffered the poorly-received animated feature “Mars Needs Moms”. So, now the House of Mouse hopes to recapture the unbelievable success of 2010’s “Alice in Wonderland” by appealing to the built-in fan base and nostalgic pull of both the fantasy genre and the books so many of us grew up with. They’re hoping that trading in Lewis Carroll for L. Frank Baum, Tim Burton for Sam Raimi and Johnny Depp for James Franco, pays off. In the dustbowl days of Kansas, small-time magician Oscar “Oz” Diggs (James Franco), is growing tired of his cheap tricks in a traveling circus. He may be a sly showman, but he takes his disdain out on his assistant Frank (Zach Braff) and his restlessness out on his one true love Annie (Michelle Williams), who’s moving on without him. When his womanizing ways angers a jealous carnie, Oscar escapes into a hot air balloon during a looming storm and gets swept away by a tornado that drops him in a land like he’s never before seen. He meets the seemingly naive Theodora (Mila Kunis), a captivating young woman who lets him know he’s landed in Oz and pegs him as the one who is to fulfill a legendary prophecy of a stranger named after her land, who would defeat the Wicked Witch. While flattered by Theodora’s faith, the con man is drawn more by the promise of riches, but is soon overwhelmed with the responsibility of bringing peace to the people of the land. 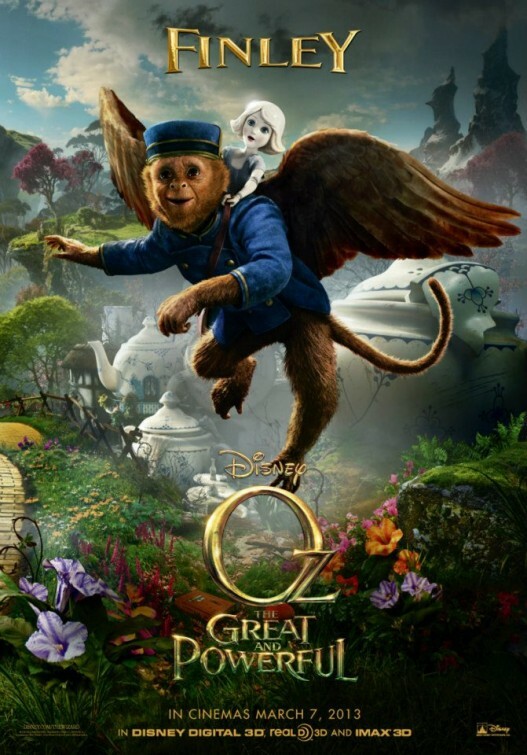 On route to the Emerald City, she falls for Oscar as they meet a friendly flying monkey named Finley and a tiny fragile yet feisty China Girl (voiced by Joey King), as they make their way to meet Theodora’s older sister, Evanora (Rachel Weisz), who has a penchant for messing with her sister’s head. Before Oscar can claim his riches, he must kill the Wicked Witch, which leads him to meet Glinda (Williams again), the beautiful witch of the South. 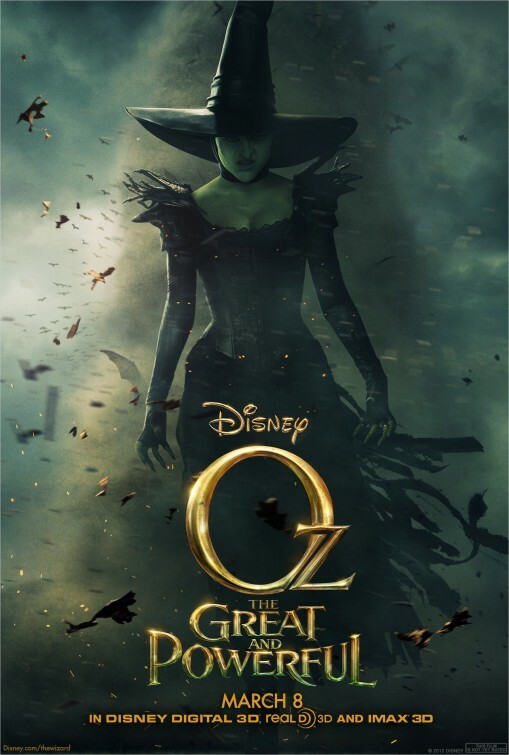 She sees Oscar for what he is and yet holds to the hope that the good in him will kick in at a time when the many inhabitants of Oz are in desperate need of a savior. If any of that sounds familiar, that’s because it is. Besides the archetypical storyline of a charlatan gradually becoming something “Great and Powerful”, Raimi delights in injecting this prequel with a great deal of admiration and respect for “The Wizard of Oz” we know. He even sticks with the same formula of that 1939 classic, by starting off in black-and-white Kansas in a square box old-time aspect ratio that gradually opens to a widescreen kaleidoscope of colors once Oz is transported to the land with his namesake. He does all this by utilizing 3D in an absorbing and creative way, adding layers of depth and bursting off the screen with fire-breathers and flying baboons. At no point does the familiarity feel tired or overdone. It’s a fun and infectious trip that keeps the audience engaged and intrigued. Compared to “The Wizard of Oz”, there’s an obvious difference in how polished and glossy “The Great and Powerful” is with its visuals. That’s unavoidable considering what Raimi wants to show us. The original film didn’t have all the glossy and gorgeous CGI technology that the director provides here. Back then, there was more of a hand-made texture to it all, with an endearing on-set quality to the production design, but now anything is possible. Raimi opens up the land of Oz to take us through an expansive fantasyland that is nothing short of breathtaking. 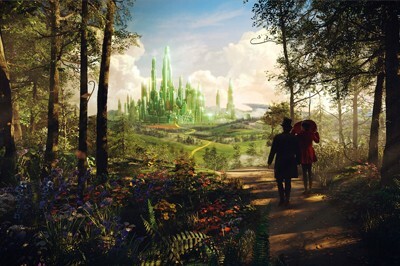 From giant, uniquely designed flora to the atmospheric enchanted forest to the cleverly-crafted China Town, the movie has an absorbing geographic variety. It may seem odd for a prequel to look more dazzling and impressive than the original film (something “Star Wars” purists complained about with the prequels), but the approach is inevitable and it at least stands out by providing a more immersive and striking viewing experience. There’s an understandable need to employ a certain amount of CGI in modern fantasy films, considering all that’s available. Thankfully, Raimi doesn’t succumb to the hi-tech tools some filmmakers do, like say Burton did in “Alice in Wonderland”. 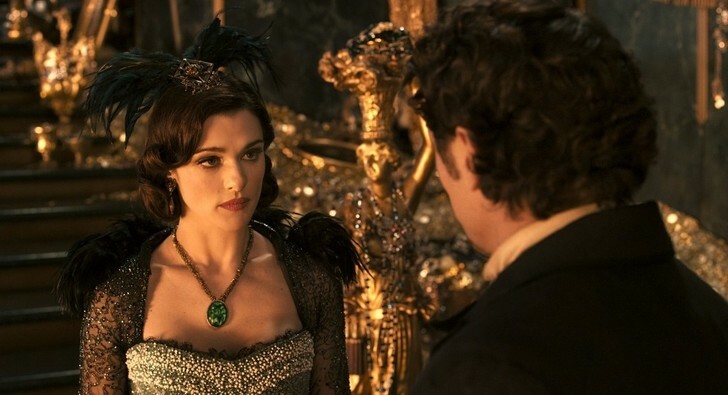 He’s accompanied by some talented filmmakers here, evident in the fine cinematography by Peter Deming (“The Cabin in the Woods”) and in the wonderful production design provided by Robert Stromberg (“The Hunger Games”), both of whom are enthusiastically up to the task of making the fantasy environment complement (not overwhelm) the environment of “Great and Powerful”. The character animation is a standout element in this visit to Oz, especially with the China Girl and Finley characters. Surprisingly, they feel and look like actual actors, with their convincing expressions, reactions and enjoyable interactions with others, especially their comic timing. It must be a treat as an actor to hear your voice come out of a porcelain doll and a monkey in a bellhop uniform. The most anticipated character, the Wicked Witch, also gets a noticeable visual overhaul. She has the same green hue that Margaret Hamilton had, but this time around her features are more angular and her body language a bit more manic. The use of heightened drama and palpable fright whenever the Wicked Witch is a reminder that Raimi is the same guy who made “Evil Dead 2” and the recent “Drag Me to Hell”. I was never curious about the origin of such an iconic cinematic character, but I sat there intrigued and entertained by how it all played out. On that note, I was also never yearning for another “Oz” movie. Disney tried it before with “Return to Oz” back in 1985 (a decade which saw a lot more experimentation in the fantasy genre) and failed, despite being more loyal to the Baum books than this film is. So, even though Raimi (a director I admire) was attached to this movie, I didn’t find myself brimming with anticipation – especially when I found myself suffering from trailer overkill. The big draw for me then were the three actresses involved. I knew Franco would flash his grin and charm his way throughout the picture (he actually adds a genuine vulnerability to Oscar as well), but my concern was with the ladies. I consider Weisz, Williams and Kunis to be some of the best actresses working today and for them to sign on to a big-budget fantasy flick, well, I was intrigued and a little concerned. Would their considerable talents be reduced to silly roles with ludicrous dialogue? Not at all. In fact, the three of them are the big draw here. They all have different roles and provide welcome subtleties to their characters. It’s a pleasure to watch them work the camera and their performances alone are enough to make me return for repeated viewings. At times, the screenplay by Mitchell Kapner and David Lindsay-Addaire (“Rabbit Hole”) finds itself in a narrative lull, with Oscar’s journey taking a bit too many turns down the yellow brick road. It feels like it’s elbowing the audience with nostalgia more than it is showing us anything completely new. While we’re introduced (or reintroduced) to the indigenous people of Oz, such as Quadlings, Muchkins, Tinkers and Winkies, they just serve a specific function and purpose and lack any real personality. Still, I like the characterization and themes given to the main characters. The dramatic and tragic turns that Theodora takes is welcome (pay close attention to her tears), but the reason behind Evanora’s manipulative ways seemed thin. The idea though that a con man lacking confidence can find purpose and, yes, greatness (albeit with the help of some crafty prestidigitization) was quite clever even though it was predictable. It’s safe to say that Oscar wouldn’t have become Oz without the women in his life, particularly William’s Glinda. As much as I thought it wouldn’t feel like “a Raimi picture”, the director’s trademarks (like his manic rhythm) really is felt. As usual, Raimi also includes certain family members along with a fun part for Bruce Campbell. It actually feels like a remake of 1992’s “Army of Darkness” in many ways, that is, if you’re in the know. All of those nods and inclusions adds to both the comedy and the oddity. 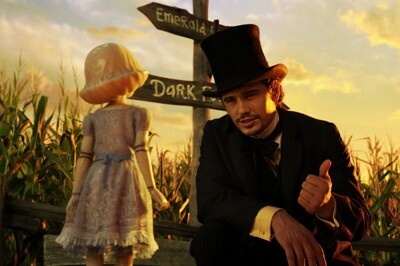 Overall, Raimi’s “Oz the Great and Powerful” does a fine job, alluding to the classic film in areas while creating a family film with its own enchantment. It is with surprise that I found the movie to be as delightful and fun as it was. It would also be nice if it could end there, but alas, we know how Hollywood works. Although, it really has no other competition, this is the most fun I’ve had at the theater all year. I went and saw this with my 6 1/2 year old son 2 days ago. He was transfixed and has since been acting out all the parts! It does get a little unnerving to have one’s son break out into a loud Wicked Witch cackle at dinner! I actually checked out for about 15 minutes in the middle, but more for lack of sleep than any poor reflection of the movie. I LOVED the opening credits and the whole b&w beginning. I would have never guessed that 3D could be so effective in black and white. I really hope more films use this, and who knows, maybe this could somehow allow more films to be made in b&w, which would make me very happy. I think I’ll take my son again next week and check it out in 2D to compare, and to see the parts I missed.. I can totally relate to that “lack of sleep” bit. Thankfully, this one was lively enough to keep me awake and attentive. Was he at all unnerved by the screaching baboons or the Wicked Witch? Nope, he wasn’t in the least bit scared by any of it. A little startled when a baboon came out of the mist, but that was just the surprise and the 3D. He almost never gets scared watching movies, unlike his father. I used to be petrified as a kid, during the original “Wizard of Oz” when the Wicked Witch showed up on top of that shed or whatever and threw a fireball at Scarecrow. I can’t watch horror/scary movies at all. There’s a reason why I haven’t seen “Prometheus” or “Cabin in the Woods”, as much as I’d like to!